HELENA, Mont. (AP) — Industry-funded opponents of Montana citizen’s initiatives to raise the state’s tobacco tax and add new mining regulations are vastly outspending the measures’ supporters to put their messages in front of voters about a month before Election Day, according to campaign finance reports. One ballot initiative would raise taxes on cigarettes and snuff for the first time since 2005, and tax vaping products for the first time ever. One tobacco giant in particular, Altria, is spending millions of dollars to flood the state’s airwaves with ads to defeat the initiative after successfully lobbying against a similar measure killed by the Montana Legislature in 2017. Altria, the parent company of Philip Morris USA, has funneled more than $12 million to a committee organized to oppose the measure, Montanans Against Tax Hikes. That $12 million in loans and in-kind contributions, along with $267,000 from the lobbying arm of R.J. Reynolds’ parent company, represents nearly the entirety of Montanans Against Tax Hikes’ funding. Montanans Against Tax Hikes spent an average $895,000 a week in September and in the beginning of October on television, radio and print advertising, according to an Associated Press analysis of the report filed Monday. That much money goes a long way in Montana, which has relatively low rates for political ads. For example, regular viewers of one television station in Billings will have the opportunity to see 57 ads this week against the tax measure, also known as Initiative 185, according to Federal Communication Commission filings. 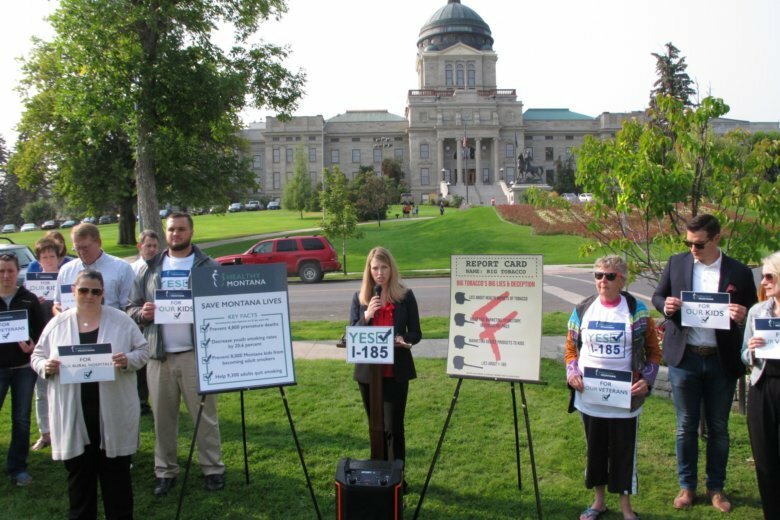 “Montanans Against Tax Hikes is running an aggressive campaign to ensure voters understand why they should reject I-185,” said Charles Denowh, the group’s spokesman. Sponsors of the tax initiative are struggling to keep pace with the tobacco companies’ rate of spending, even with a $3.5 million contribution from the Montana Hospital Association last month. The ballot committee, Healthy Montana for I-185, has spent an average of about $405,000 a week this month and last, which is less than half of the tobacco companies’ spending, according to filings. Revenue from the tobacco tax would continue the state’s Medicaid expansion program, pay for other health programs and some go to the state’s general fund. The tobacco companies’ ads say the tax would create an unfunded mandate because it doesn’t fully fund the Medicaid expansion program. Kathy Weber-Bates, a spokeswoman for the initiative sponsors, said tobacco already costs the state hundreds of millions of dollars a year in health care costs, taxes and lost productivity. But the tobacco companies fail to mention the health care savings from people who quit smoking or don’t start because of the tax, she said. “Those numbers are all being drowned out by big tobacco-funded ads designed to protect their profits and hide these facts,” Weber-Bates said. Another group funded by five mining companies has spent about $828,000 in September and October on ads to defeat an initiative that would add new requirements to mine cleanup plans. Initiative I-186 would require any new hard-rock mine to submit a plan with clear and convincing evidence that the mine won’t require the perpetual treatment of polluted water once it ceases operations. The companies, which mine copper, silver, gold, platinum and other minerals, say the language is so vague that environmental groups will use the measure to prevent any new mines from being developed in Montana. Initiative sponsors have said the mining companies are using scare tactics to mislead voters. The sponsors report spending $110,000 on ads at the end of September, which is about an eighth of what the mining companies have spent on ads over the same period. The initiative’s backers, made up of several environmental and wildlife advocacy groups, say the measure would prevent mining companies from leaving behind permanent water pollution and saddling the state’s taxpayers with the costs of dealing with the cleanup.